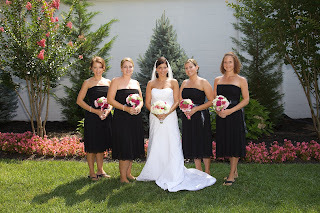 Tami and Chris were married on July 25th at the Valley Country Club. 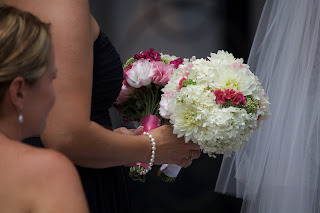 Tami's bouquet was made up of white hydrangeas, white dahlias, green sedum, pink lisianthus, green lisianthus and pink celosia. Tami wanted a classic style bouquet; tight, rounded, with short stems. The bridesmaid's bouquets were made up of white lisianthus, pink lisianthus, pink sweet william, green sedum and pink celosia. The cake was decorated with pink, white and green lisianthus. All of the flowers were grown on Maryland Farms including: Farmhouse Flowers, Locust Point Flowers, Belvedere Farm and Bridge Farm Nursery. Photos were taken by The Pro's. I'm never sure how things work with "regular" florists or floral designers. Maybe they've had this happen-maybe not. Either way, we here at LoCoFlo think it's pretty cool. 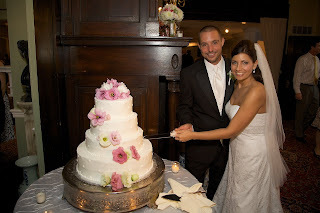 Back in June, we created the flowers for Sara Gervase and John Hill's wedding. Marina and I knew when we met Sara back in the fall, that we would hit it off. She was so easy going and excited about her wedding. She was interested in learning about the flowers that would be available. She was from Buffalo! (in case I haven't mentioned it-I'm from Buffalo and so is Marina's husband-whose family lives one block from Sara's family...i know, i know, it's a small world). Anyway, we loved working on Sara's wedding. We were equally excited that Sara let us know that she would be interested in "interning" with us. She said she was interested in learning about what we do, about the flowers, about designing etc. So, last Friday, as we prepared for two pretty big weddings, Sara came to help. For a while she just tied raffia on buckets (not much of a learning curve there) then she started working on the table arrangements with Marina. For her finale, she made two beautiful poseys. We are definitely looking forward to having Sara come back to help again. Last week Eric and I went to San Francisco for our friend Craig's 40th birthday party! It was great fun to see our old friends, check out our favorite spots and eat our favorite foods! Our fist day in San Francisco was spent walking through Bernal Heights, the Mission, the Castro, the Haight, Hayes Valley and Yerba Buena gardens. One thing I noticed, that was drastically different from Baltimore, was the plethora of cut flowers every where we went. There are flower shops and flower kiosks; cut flowers being sold at grocery stores, corner stores and liquor stores; cut flowers being sold at dress shops and baby clothes stores. There are cut flowers everywhere. I’m not talking about the alstromeria or carnations or spray roses that you see at the Giant either. I’m talking about a dozen varieties of dahlias, hydrangeas in every shade of pink, blue and purple you can imagine, lisianthus, orchids, alliums in all sorts of shapes and sizes, proteas, bells of Ireland and more. There were loads of flowers I had never seen before too. What I especially loved was that at most of these spots, there were a dozen or more types of branches, seed pods, berries and leaves. All this and it was just the first day! 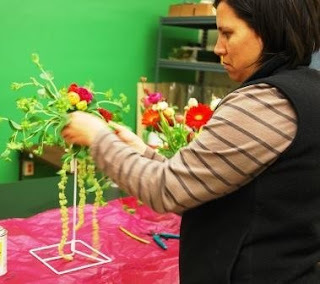 Coming soon...the farmers market and the San Francisco Wholesale Flower Market! Green Bride Guide Shout Out! The Green Bride Guide is a great website for anyone who is interested in planning a Green Wedding or event. 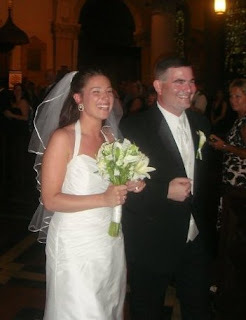 Kate Harrison started the website and wrote her book "The Green Bride Guide" after trying to plan her own eco-friendly wedding back in 2006. We love The Green Bride Guide and often refer our clients to the website to get ideas on Green elements that they can incorporate into their own events. We were first introduced to Kate last summer after reading about her in the New York Times. After we connected, she did a great "Real Green Wedding" story on our friends/clients Cathy and Nick. 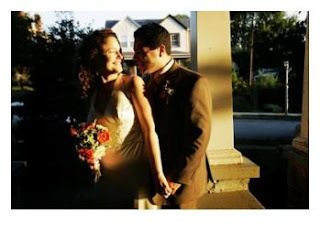 In the fall, I was contacted by Nathalie Wilson-Cone who had seen Cathy and Nick's story and was interested in using local flowers for her wedding. We had a great time working with Nathalie and her husband Cory. 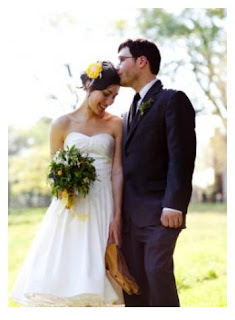 We're also really excited to have them featured as the most recent "Real Green Wedding" on the Green Bride Guide. Check them out! The Baltimore Sun ran an article Thursday about how local grocery stores are trying to get on the Local Produce band wagon. What they're finding though, is that buying local is logistically difficult for them. They are used to having things shipped to them from all over the world-easy-peasy. Buying Local, whether it's produce or flowers, doesn't exactly work that way. For us, buying locally grown cut flowers for weddings and events starts with building relationships with farmers. We visit them at the farm, at the markets, at conferences and at other events. We learn about what types of flowers they grow and how they grow them. We keep track of what they have available when and how the weather effects what's available. Next is placing the order. Marina says it's like a puzzle. She makes a "wish" list of what flowers she thinks would work best based on what the bride/client likes, what the wedding colors are, what the style is and what she thinks is in season. Then she sends it out to the farmers. The farmers respond (by email, fax and phone or in person when we see them) to let her know what they have and don't have. Marina adjusts her order accordingly. This back and forth could go on for days. When figuring out the order, we also have to figure out how many farms we have to go to, if we can pick up at a local farmers market, if the farmer can deliver. Often times Marina or I drive to the farm and actually pick the flowers with the farmer. That's the most fun and best for the client, because we can see what the farmers have growing. Maybe they didn't mention that they would have some little gem; maybe they only have a few stems, but that would be enough for the bride's bouquet; maybe they have something they didn't think would be ready earlier in the week. This is one of the true joys and benefits of buying local. Dave Dowling of Farmhouse Flowers picking ranunculus for a bride's bouquet. Finally, we have the flowers and we get to work. Unlike traditional florists, we never know what we're going to have until we have it. There is no recipe. No arrangement or bouquet ever looks the same. Each time we come to "work", the creative process is in full swing. We have to figure it out again and again. But that's the beauty of it. Creating something new and unique and beautiful each and every time. So for us, buying local makes all the difference! So LoCoFlo has a little break from events, until July 25. Since our Spring was so busy, this break comes at a great time. It means we can catch up on all the other things we've been meaning to do but haven't had time to do (put our pictures up on Flikr, finish the Coolbot, update our available flower lists). 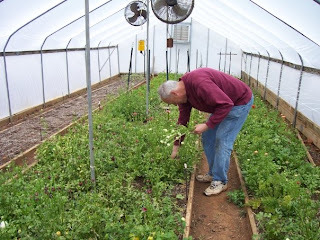 One of the things I've been doing is planting some of our favorite LoCoFlo flowers/greens from this Spring. With the houses/yards that Marina and I have right now, we'll never be able to grow enough to supply LoCoFlo (that's what we have our growers for!). Even so, I still want to try these out for myself. So here are some that I'm trying on a shady hill in front of my house. 1. Mountain Mint: Mountain Mint is one of our favorite greens to use in bouquets and arrangements. It comes in a dusty green or a brighter apple like green. It has a sturdy stem and holds up well out of water. It also smells great-especially in boutonnieres! 2. Lily of the Valley: These little jewels are popular with Spring brides. In the Spring they sprout delicate white blooms gently hanging from it's sturdy green leaves. From everything I've read, these shade loving perennials are supposed to spread easily. We'll see how they do on my shady front hill. 3. Hens and Chicks: These succulents have turned out to be great in bouquets and boutonnieres. They take a little bit of work to wire them up, but they are really cute and have great texture and color. We've used them several times this past Spring; most notably in a mostly green Spring bouquet. 4. Rosemary: We always seem to end up using Rosemary when we're in a pinch. It's our "Go To" green filler. Its great in boutonnieres, bouquets and arrangements of all kinds-and again-like the Mountain Mint-it smells great. I planted some others too; more sedum, coral bells, ferns and asilbe. I'll keep you posted as the summer goes on as to how they do!